The sales of Federal Poly Ede HND form earlier scheduled to close on August 31, 2018 is now extended till September 23, 2018. This is contained in the online/portal update as released by the school's management. This is to notify the General Public that HND Form for 2018/2019 Academic Session closes on Sunday 23rd September, 2018 (11:59pm) and HND Screening Examination holds on 2nd & 3rd October, 2018. Reprint for venue schedule Starts on Monday 24th September, 2018. All interested applicants can take advantage of this postponement to obtain the form and partake in the screening exercise as detailed in the official statement. 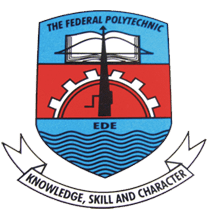 The Federal Polytechnic Ede HND form is opened to holders of National Diploma from the school and any other recognized polytechnics to pursue their Higher National Diploma. Check the form adverts for further clarification. Note also that this extension affects applications for National Diploma (Daily part time and regular) and the Remedial programme.